Each link consists two parts - visible text and URL address. Links are great way to refer to materials, which are already available on other page without creating unnecessary duplicates. At first open the text paragraph, where you would like to add link. Select those words, which should be linked with cursor. Selected text appears with different contrast and color, usually on blue background. After you selected link text, click 9th button on second row to open URL editing dialog (Insert/Edit Link). For better recognition, it has chain icon on it. For opening URL editing dialog, click on "Insert/Edit Link" button. "Insert/Edit Link" dialog has field "Link URL". Paste link target address there and save. Add destination url to field "Link URL" and save your work. Now you have link, which looks with different color and usually uses underlining. You may edit link further by opening editing dialog again and clicking to link text. 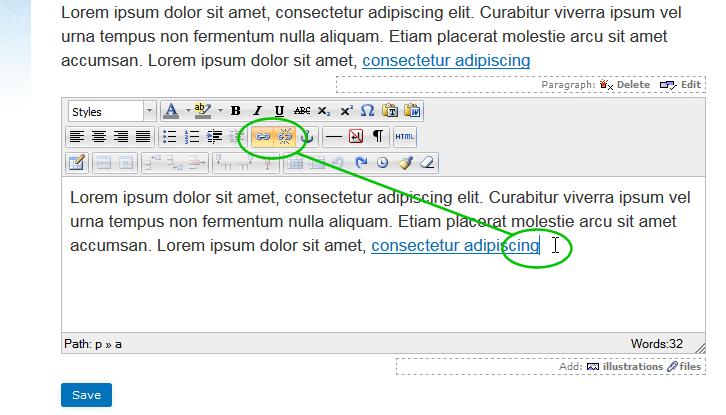 See how link editing buttons become active, if you selected link again. Using relative links for your internal linking makes it easier to migrate from one protocol to another, for example from http to https, or migrating to another server and domain, if there are foreseeable organisational changes. 1 Select link text At first open the text paragraph, where you would like to add link Each link consists two parts - visible text and URL address. Links are great way to refer to materials, which are already available on other page without creating unnecessary duplicates.